A research project of the Department of Archaeology. This project is supported by the Leverhulme Trust and the University of Durham. Access to water resources was vital for the survival of ancient peoples inhabiting arid landscapes. In such regions, surface water quickly becomes unavailable through evaporation or infiltration into the subsurface. To gain access to the subterranean water supply required new and innovative techniques. One example of this innovation was the development of the qanat: an underground channel. Through the construction of qanats, the groundwater supply could be unlocked and utilised for irrigation and consumption. The qanat is effectively a water tunnel dug horizontally into the subsurface towards a vertical, water-producing well (termed the ‘Mother Well’). The ‘Mother Well’ is located in the hinterland, with the qanat tunnel conducting the water towards the dry plains. Along the path to its final destination, a number of vertical shafts are dug into the horizontal tunnel to: 1) allow for better oxygen supply to the workers; 2) easily remove the excavated material; and 3) provide ease of access during routine maintenance of the tunnel. The material removed from the qanat via the vertical shafts is piled onto the ground surface surrounding the opening to form a mound resembling a ring, and often referred to as a ‘doughnut’. Once the qanat is completed, the water flows by gravity along the tunnel to a collection pond where it can then be redistributed for irrigation purposes. The dating of the construction of qanat systems, however, is rather difficult to pin down. In some instances, historical documentation or association with nearby settlements can help shed light on the age of construction. In many instances, the use of radiocarbon dating is not applicable due to the lack of preserved organic material within the qanat mounds. Other means are, therefore, required to estimate the time of construction. Our project aims to develop a method for the routine dating of qanat mounds using optically stimulated luminescence (abbreviated to OSL) dating of sand grains. The OSL method works as a geological ‘clock’ which was reset to zero during the last exposure of the sand grains to the sun (in this case, during the construction of the mounds). The time elapsed since this solar ‘resetting’ of the sand grains can be measured in the laboratory. The age of construction can be determined if the earliest construction sediment remains preserved at the base of the mound. 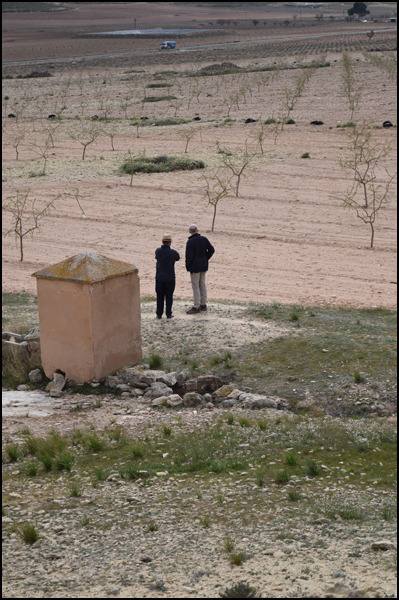 To obtain an understanding of mound morphology and the variability in OSL characteristics, a range of qanat systems in southern Spain, Morocco and, potentially, Oman are to be investigated. Qanat system located north of Jumilla in Murcia, Spain.